It goes without saying that your website’s performance hinges on its content. Having invested resources into your website, you want to be certain it delivers the right customer experience to your visitors and, most of all, that it yields expected business results. You bring UX and web designers on board, perform A/B testing, and maybe even splash out on eye tracking. Then you regularly count page views logged by your web analytics tool. Yet, parts of the website still remain beyond your control. Given the amount of effort you’ve made, wouldn’t it be nice to measure the whole thing? What you can’t measure, you can’t manage, as the saying goes. In this blog post we want to introduce Content Tracking in Piwik PRO – a feature that puts you in control of every piece of content on your website. What Exactly is Content Tracking? 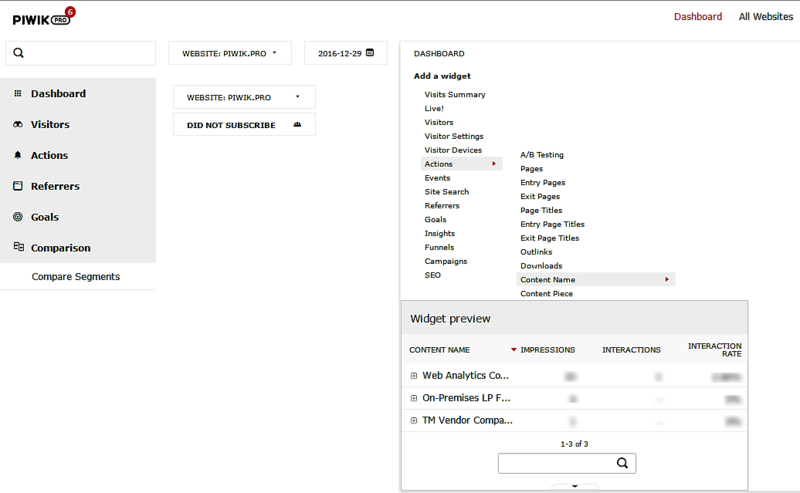 As we’ve mentioned, Content Tracking is a feature of Piwik PRO web analytics. It enables you to measure the performance of individual pieces of content on your website or in mobile apps. It tracks ad banners, partials and popups, helping you detect top performers. It counts numbers of impressions and clicks, as well as click-through rates of particular elements. Yes, you do. Content tracking gives you insights into the performance of individual elements of your website or app that don’t generate page views and that aren’t tracked otherwise. Tracking these bits of content effectively can give you precious business clues such as which visitors are potential leads and how to get them to accomplish your website’s micro and macro goals. By measuring otherwise untracked blocks of content you maximize the control you have over your website and, ultimately, your business. Tracking more content doesn’t necessarily mean more trouble when your hands are full anyway. 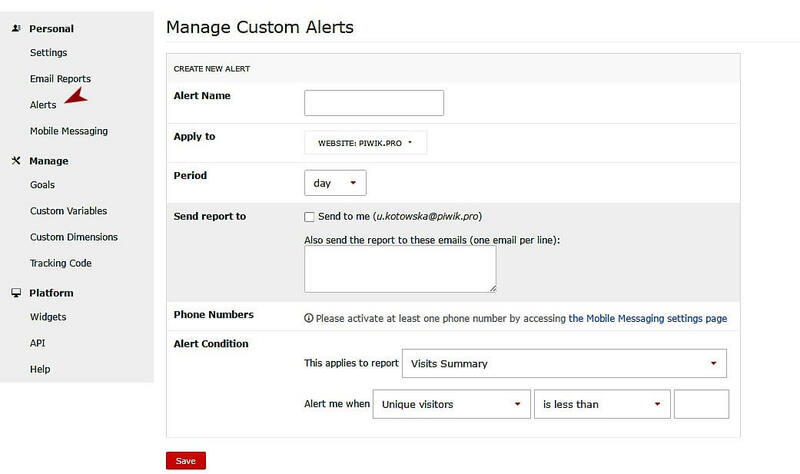 Piwik PRO offers an option to set alerts (see Personal Settings), so you can focus on other business activities. The tool will notify you of any impressions or interactions you’ve singled out for tracking. A great example of when content tracking comes in handy is measuring the effectiveness of popups. We’ll discuss it a little more later on in this post. They’ll serve as a background for explaining the implementation of this functionality. Imagine you have configured your popup to appear at a certain scroll position. The default settings of Piwik PRO only tell you only how many times the page with a popup was uploaded. You are still missing information on how many people have seen and interacted with the popup itself. Wouldn’t this be useful data for your business? Piwik PRO Free Tag Manager Vendor Comparison Sheet popup. Piwik PRO code behind the Free Tag Manager Vendor Comparison Sheet popup - before implementing tracking attributes. 3. Declare content pieces – you need to define their names: [data-content-name=””] (see the yellow arrow in the picture below). Tracking content on the example of Piwik PRO popup. By tracking content with HTML attributes or CSS classes you can also choose whether or not you want to track just the viewable bits of content or all the content on a page. By viewable content I mean what is above the fold or not encrypted. 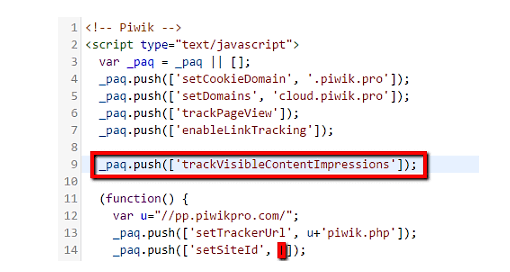 If you set Piwik PRO to track all content, it will log all the uploaded content – regardless of whether your visitor has actually seen it or not. This is probably of little value when you consider that tracking only visible blocks of content is helpful from the business standpoint, as it gives you more actionable feedback. As we’ve already mentioned earlier in this post, apart from tracking content impressions, you can also track visitors’ interactions with it. Piwik PRO does this automatically – there is no need to alter the code on your side. However, we recommend using HTML attributes as they allow you to set specific values for content name, content piece and content target. The reports also contain a row evolution graph which lets you track trends in the performance of a given content block as well as analyse historical data to draw conclusions and optimize future marketing activities. As we’ve already mentioned, our secret plan in placing the popup on the Piwik PRO Tag Manager website page is to discover who might be interested in learning more about the product and starting cooperation with us. From experience we know that the visitors who are the most likely to show a real interest in our product are those who have already engaged with other pages of the website. To maximize the efficiency of our visitors’ time we’ve created a segment specifying which visitors are potentially interested in interacting with us to discuss the benefits of Piwik PRO Tag Manager. This way we have a more in-depth understanding of how the popup performs. This Custom Segmentation feature proves useful especially when tracking well-performing content. It helps you single out the most promising leads so your sales team can engage in only desired interactions.